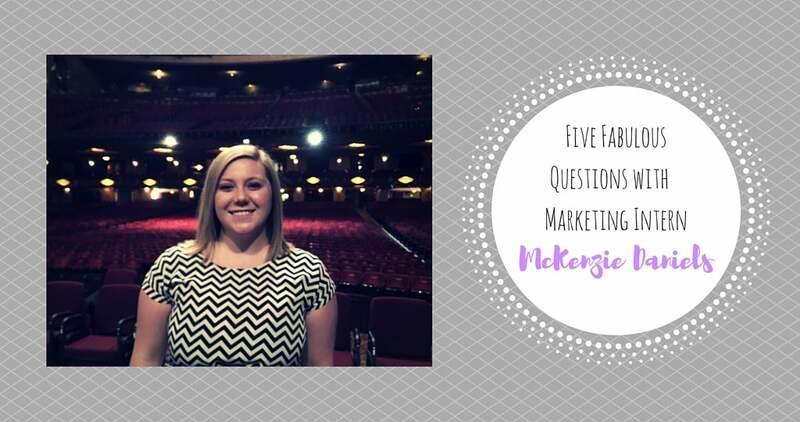 My name is McKenzie Daniels and I am the summer 2016 Marketing Intern for the Fabulous Fox Theatre! Currently, I am a senior at Eastern Illinois University in Charleston, Ill where I am pursuing a Bachelor of Arts degree in Communication Studies. Within the Communication Studies field, I focus primarily on courses relating to Corporate Communication and Public Relations. Some of my hobbies outside of school include reading, participating in my sorority’s events, and rooting on St. Louis sports teams. I can almost always be found singing or humming along to musical soundtracks. Last summer, I was lucky enough to intern with the St. Louis Cardinals as part of the Corporate Sales & Marketing department. I am so excited to be joining the Fox marketing team because I have a passion for the arts and undeniable respect for those who perform. Knowing this, I wanted to become a part of an organization that continually supports these endeavors. This position allows me to combine my enthusiasm for Broadway classics with the skills that I have obtained and honed through my education thus far. I am grateful for this opportunity to broaden my horizons by doing something I love. The first theatrical performance that I ever experienced was my high school’s production of Beauty and the Beast. I had always been a fan of the movie, but seeing such a classic film brought to life by people I actually knew was amazing. The singing, the dancing, all of it took my breath away. Being able to see first-hand the joy that live theatre can bring to people was life-changing for me. From then on, I was obsessed with learning all that I could about the Broadway world. If I could see any performance at the Fox, it would have to be Hamilton. This show is so unique in how it incorporates our country’s history with a contemporary music style. The background of how the show began also really interests me. Lin-Manuel Miranda derived the concept for the musical after reading Alexander Hamilton by Ron Chernow, a bibliography of Alexander Hamilton. Seeing a Founding Father’s life unfold on stage is new and exciting. The show that I am most excited for this season at the Fox is Annie. I grew up watching and singing along with the 1999 movie countless times. For a while, I wanted people to call me Annie because I loved the character so much. Annie was a major part of my childhood and holds a special place in my heart! I can’t wait to see the show! The most fabulous thing about St. Louis is that there is something for everyone! It’s impossible to be bored here! Concerts, museums, world-class sporting events, you name it, St. Louis has it! My personal favorite things that STL has to offer are the St. Louis Zoo and Broadway shows. Whether I want a relaxing day or something a little more fast paced, I know that St. Louis is the place to be!